Is Lord Krishna just a messenger for a higher, impersonal truth? Bhagavad-gita is the record of a conversation that took place between Lord Krishna and the great warrior Arjuna in approximately 3,000 b.c. Krishna, standing with Arjuna on a chariot between two massive armies poised for war, explained to him the details of spirit, matter, and the controller of both. 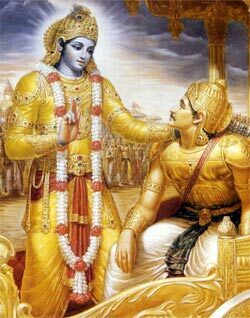 For the past five thousand years scholars all over the world have struggled to understand the meaning of Bhagavad- gita, but many have failed to grasp the key to this understanding: recognition that Krishna, the original speaker of Bhagavad-gita, is a person, the Supreme Person. In common usage the word person refers to an individual being, distinct from others. A person has form, qualities, and a history by which others can identify and describe him. A person can express himself and understand ‘the expressions of others; he has feelings and desires and can share relationships. In the context of Bhagavad- gita, the word person refers not only to the limited mortals of this world but also to higher beings, such as demigods, and to God Himself. It is on this issue of the personality of God that the two major classes of Bhagavad-gita scholars divide. The impersonalists, or mayavadis, believe that God has no form, qualities, or activities. They conceive of Him as a shapeless, impersonal entity, often as an all-pervading white light. And since the mayavadis believe that God, or the Absolute Truth, is without varieties, they also maintain that all varieties are false, or illusory. According to the mayavadis, whatever form, color, sound, taste, smell, or touch we perceive is unreal, and thus personality and personal relationships are also unreal. The impersonalists’ ultimate goal is to lose all personal identity and merge with an impersonal God. The personalistic Bhagavad-gita scholars reject the idea that God is a formless entity. On the contrary, the personalists, or Vaishnavas, maintain that God’s personal form is the source of all others. Some varieties, they say, are temporary and in that sense illusory, but others are permanent and real. According to the Vaishnavas, God and His abode possess eternal forms that can be realized and attained. Thus the ultimate goal of the personalists is to perfect their relationship with God through service and love. When these two groups—the impersonalists and the personalists—approach Bhagavad-gita, their conclusions naturally differ. The impersonalists believe that Krishna, the speaker of the Gita, is an ordinary man, a historical or even mythical figure. He is a mouthpiece, they say, for the higher, impersonal truth that is God. The impersonalists believe that the statements of the Gita should not be taken literally; rather, they should be interpreted in one’s own way. To them, Bhagavad-gita is an allegory, a mere story containing hidden philosophical meanings, understandable by deliberation and interpretation. Personalists, on the other hand, accept Krishna as the Supreme Godhead. Therefore they regard the statements in the Gita as the Lord’s direct instructions for our benefit. Rather than interpret the words of the Bhagavad- gita, the personalists understand them according to their literal meaning. Objectively speaking, there is no need to interpret the statements of Bhagavad-gita, because interpretation only covers their authority. The verses of Bhagavad- gita are as clear and bright as the sun, and interpretation is like a cloud that obscures their light. A statement needs interpretation when its meaning is unclear. For example, if I say, “The village is on the Ganges,” someone may require an interpretation, because on the Ganges may mean either “on the bank of the Ganges” or (by some stretch of the imagination) “on the surface of the Ganges.” In Bhagavad- gita, however, the meaning is simple and clear. There is no interpretation required. Still, people interpret it. Why? First, though the meaning is clear, persons confused about spiritual life cannot understand even the simple concepts presented in Bhagavad-gita. Therefore they derive their own explanations of Krishna’s words. Second, many cheaters and hypocrites twist and distort the meaning of the Gita to spread their own self-motivated doctrines. They know that Bhagavad-gita has been popular for thousands of years. Taking advantage of this popularity, they hope to gain an audience for their views, which they pass off before the public as commentaries on the Gita. Krishna Himself, however, neither sanctions their ideas nor gives any conclusive evidence in Bhagavad-gita to support them. An interpretation of Krishna’s words that ascribes to them a meaning different from their original grammatical and semantic sense can only mislead the reader. Krishna’s teachings are meant for the enlightenment of anyone who hears them, but one must accept them as they are in order to receive their beneficial effect.